With the end of this semester's first week, it is already becoming apparent that Signals and Systems is going to be my hardest class. Generally, this is consistent with what my peers have told me. While the content (interpreting electrical signals) looks like it will be interesting, it utilizes large amounts of calculus and differential equations. With this, I'll need to be doing a lot of refreshing on my past math courses. This was also my first week back at John Deere (for my internship), and yesterday I was able to get some tasks assigned for me to work on in the upcoming week. This is exciting for me, since being idle at work is never fun. I look forward to doing some work in the lab, even though it means I cannot drink coffee (no food or beverages in the lab!). I'll be running some board tests to collect data on performance, which will be good experience for me working independently. I recently got upgraded to Windows 10 at work, which has made my workflow much easier. I find multiple workspaces allows me to manage my tasks more fluidly. In my very-limited spare time, I've been learning how to use a text editor called Vim. Vim is an old and well-respected text editor that runs within a terminal (for Windows users, a "terminal" is like Command Prompt, but for Linux users). This is generally regarded as a challenge, since Vim uses a very confusing interface. Besides learning Vim, my roommates and I (Jake and Alex) are working on an expansion of our current aquaponics setup. We would like to add another shelf and fish tank, with lettuce being fed with the fish water. Additionally, we are thinking of adding microgreens above the lettuce, with a smaller grow light to sustain them. We have nearly finalized our plans (sketch below), and acquired another fish tank. Next, we'll need to order more grow lights. 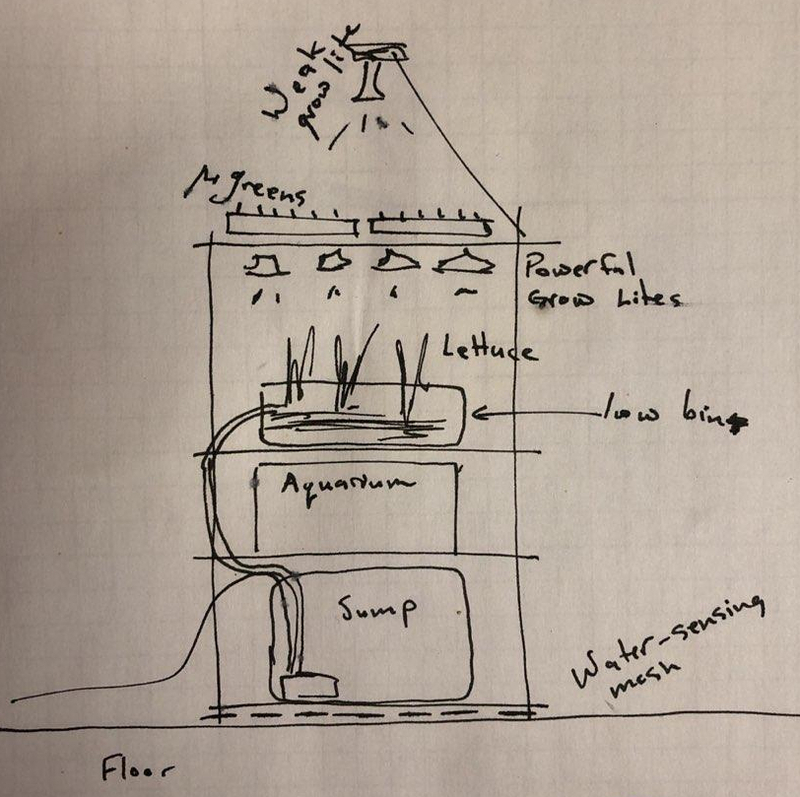 Current plan for our second aquaponics rig.